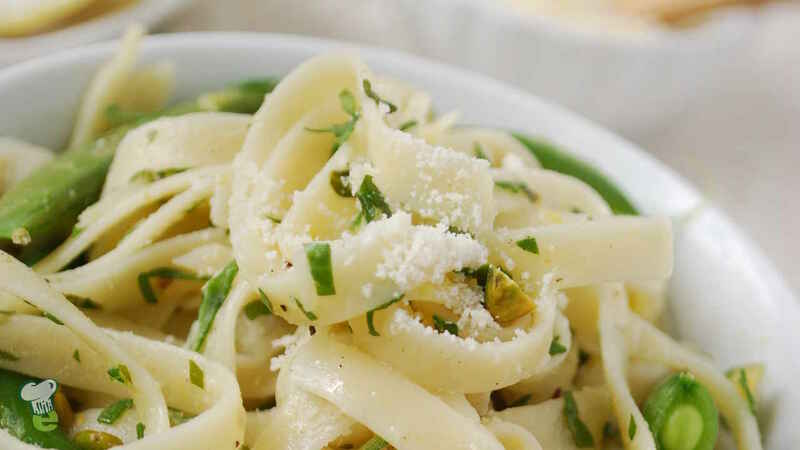 Try this delicious healthy pasta dish with arugula, sugar snap peas and a spark of lemon for a fresh-tasting pasta dinner. In a pot, cook the pasta according to package directions. Drain the pasta, reserving 1/2 cup of the pasta water. Set aside. In a large bowl, combine the arugula, lemon zest, 3 Tbsp of the Parmesan and the black pepper to taste. Add 1 tsp of the olive oil and the lemon juice and stir to combine. In a skillet, heat the remaining 2 tsp olive oil. Add the garlic and shallot and sauté until the shallot is softened, about 2 minutes. Add the sugar snap peas and 2 tablespoons of the reserved pasta water and cook for 2 to 3 minutes, or until the peas are bright green. Remove from the heat. Add the cooked pasta, the arugula mixture and the remaining reserved pasta water to the skillet with the sugar snap peas. Stir to combine. Top with the pistachios and the remaining 1 tablespoon Parmesan.